What is Windows Azure Backup? Windows Azure Backup helps protect server data against loss and corruption by enabling backup to offsite cloud storage in Windows Azure. It provides a consistent experience configuring, monitoring, and recovering backups across local disk and cloud storage, integrating with the in-box backup program in Microsoft Windows Server or System Center Data Protection Manager. Windows Azure Backup encrypts and protects your backups in offsite cloud storage with Windows Azure, adding a layer of protection in case data loss or disaster impacts your servers. It can integrate with the backup tools in Windows Server or System Center Data Protection Manager. You can manage cloud backups from these familiar tools to configure, monitor, and recover backups across local disk and cloud storage with ease. Windows Azure Backup delivers efficient data protection. It minimizes network bandwidth use, provides flexible data retention policies, and provides a cost-effective data protection solution that can be Geo replicated with ease. Data stored in Windows Azure is geo-replicated among Windows Azure data centers, for additional protection. Your data is encrypted before it leaves your premises, and remains encrypted in Windows Azure – only you have the key. Incremental backups provide multiple versions of data for point-in-time recovery. Plus, you can recover just what you need with file-level recovery. 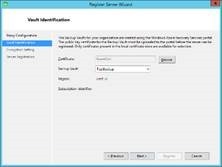 How is Windows Azure Backup Deployed? Windows Azure Backup is deployed by configuring or enabling the services on Windows Azure then installing an agent on the server that communicates with the service. In this Step-By-Step post we will go through the entire process Step By Step so you can easily deploy in your environment. Special Thanks to Blain Barton for his work in helping put together this Step-By-Step guide. c. You may have to disable IE Enhanced Security: Click Server Manager – Local Server – IE Enhanced Security Configuration – change the On to Off for administrators – Close browser then reopen browser. a. Run PowerShell from the machine you want to create certificate on: Start then type PowerShell then Right-Click on PowerShell icon and select Run as Administrator. d. Navigate to c: to see your new certificate which will be called “GuruCert_YourMachineName” Make a note of this location, you will need it later. 2) Enable Windows Azure Backup (Preview) Feature. Notice this is Preview so it is not supported by SLA yet. c. Scroll down to Backup and click on the “try it now” button. Then click the checkmark/OK button. a. 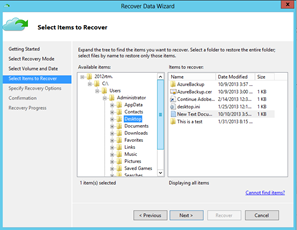 Create a Windows Azure Backup Vault: select Recovery Services from the left navigation sidebar in the Windows Azure portal. b. Click Create A New Vault. c. Enter a name for your Backup Vault (eg. TestBackup) and select the closest Region to your location. Click Create Vault to continue. g. Click the folder to upload your certificate. Browse to your certificate location (eg. C:GuruCert_YourMachineName), select the certificate file, and click the Circled Checkmark to continue. 4) Install the Windows Azure Backup Agent. a. While logged into the server you will be backing up to Azure, go ahead and add a file to the desktop so we can confirm that it can be restored. Right-Click Desktop – New – Text Document – Enter. There is now a new text document on the deskop. b. In the Windows Azure portal, you should still be on the Quick Start screen for your Backup Vault after you uploaded your certificate. If not, navigate to Recovery Services, then click on the name (TestBackup) of your backup vault. c. Click on Download Agent. For either Windows Server or Windows Server Essentials depending on what flavor you are running. Click Run to install the Windows Azure Backup Agent. e. Go through the agent installation. After you have installed the Agent, click the Circled Checkmark to close the pop-out window. The Agent installation program will create a Desktop icon and Start Screen tile. g. In the Actions pane on the right, click Register Server. The Register Server Wizard will launch. h. Proxy Configuration: Set your appropriate settings if necessary. Click Next. j. Select your certificate and click OK.
k. After you select the certificate, select your Backup Vault from the drop-down menu. Click Next. l. Encryption Settings. Enter your own paraphrase or click Generate Paraphrase. Select the location to store the paraphrase txt file. Click Register. m. After the server has been successfully registered, click Close. n. Your server has now been successfully registered with your Windows Azure Backup Vault. After your server has been successfully registered, you have to configure the Windows Azure Backup Agent to be able to test the backup function. a. You should still be in the Backup Agent. 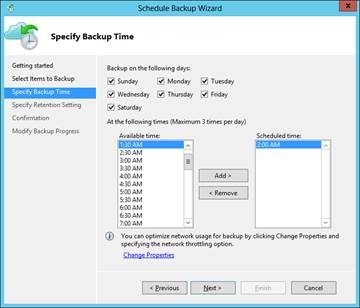 In the Actions Pane, select Schedule Backup. The Schedule Backup Wizard is launched. b. Getting started. Click Next. c. Select Items to Backup. Select Add Items to continue. For the purpose of this lab just select c:users only Click Next. d. Specify Backup Time. Choose your Days and Times to backup. f. Specify Retention Setting. Choose your setting or select the default. Click Next. g. Confirmation. Click Finish to create the scheduled backup job. i. Now that you have created a scheduled backup job, the Back Up Now option becomes available. So, let’s run a backup. j. In the Actions pane on the right, select Back Up Now. The Back Up Now Wizard is launched. Click Back Up. k. Back Up Now completed. Click Close. l. You will have a completed job in the Jobs pane. You ALWAYS have to test your backup to make sure it is working so let’s do that.